Not as needy as dogs, but typically more cuddly than cats, a pet rabbit can be an ideal addition to your family. Like any animal kept indoors, however, there are a few potential drawbacks, including possible odors. Fortunately, rabbits aren't known for smelling bad, and any odor is probably a result of improper care. Unlike dogs, rabbits don't have a body odor. You shouldn't notice any odor emanating from them. If you do, the rabbit is probably sick or has an infection. An ear infection, for example, can give off a musty smell. Occasionally, an intact male rabbit, or buck, will produce a musky scent when he's around a female, or doe. Otherwise, if your rabbit has body odor a trip to the vet is in order to determine the cause. In a healthy rabbit, the feces should be nearly odorless. Rabbit feces are small, round brown pellets that should be somewhat firm and dry. If your rabbit's feces are watery, look like cow patties or have an odor, he might have intestinal parasites or another illness. If you notice a smell coming from the feces, check with your vet. Nearly all the smell produced by rabbits comes from the urine. It has a distinctive ammonia-tinged odor that is especially strong right after urination and can be quite strong. The urine from a buck tends to have a stronger smell than that from a doe. Bucks also use urine to mark their territory, so they urinate more often, producing more scent. Containing your rabbit's urination in a litter box is very effective at reducing odor. Since rabbits tend to choose a single spot to relieve themselves, it's very easy to train your rabbit to use a litter box. Litter with a natural odor reducer, like baking soda, will help keep the smell down even more. Scented litters are not a good choice for rabbits, however, since it irritates their sensitive noses. Also wood shavings, specifically pine and cedar, can be poisonous to rabbits and are not good litter choices. When the living quarters and litter box are kept clean, with soiled litter removed regularly, a pet rabbit is virtually odorless, except for a few minutes following urination when the smell is strongest. However, if the cage and litter box are not kept clean, odor can build up very quickly and the smell can be stronger than that produced by a cat. If your rabbit smells, it's probably because his cage and litter box need cleaned. 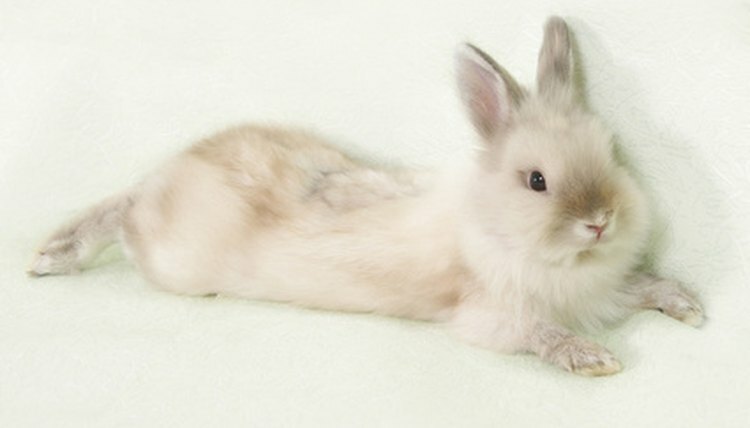 Having your rabbit spayed or neutered can help reduce odors in two ways. First, it reduces the musky odor in the urine and gives it a milder, less offensive smell. Second, it stops bucks from spraying to mark their territory. When your buck isn't urinating as much, there is a lot less odor.